I woke up in the early hours of October 2, 2017, with a knot in my stomach. There’s any number of things that can tie us up, but this one seemed immune to the usual remedies- a glass of water, a trip to the bathroom. Something just didn’t feel right. When it all became too much (which didn’t take too long, let’s be honest), I grabbed my iPhone from its resting place on the headboard above my Ikea bed and hit the button to unlock it. Then I saw the notifications of tragedy. 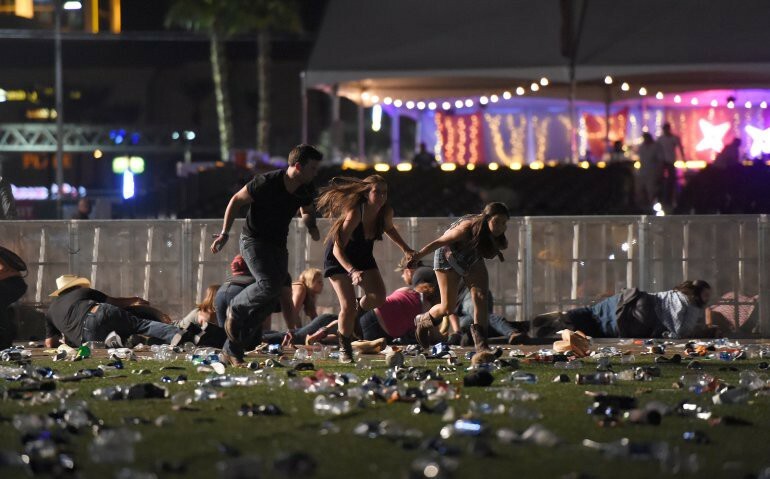 At that time I believe it was “at least 20” dead after a mass shooting at “a music festival” in Las Vegas. As someone who writes headlines for a living, I knew that “at least 20” could mean anything from 20 to 200 (the number would rise to 59 on Monday). Still, as a journalist and curious person I had to know more. So I clicked on the first eyewitness video embedded in the BBC post I was reading to see what kind of tragedy we were dealing with. I’ve seen a lot in my relatively short time in the newsroom. Helicopter footage of pedestrian versus Metra train collisions. Shootings caught on surveillance cameras. Any number of tragedies committed by one human against another — often with the bonus of being attached to a less-then-courteous message on Facebook. It’s our job (and responsibility and duty) as journalists to take this raw, unfiltered tragedy, distill it down to the verifiable facts, and shape it into something that conveys both those facts and the event’s emotional truths. Still, the unrelenting rattle of gunfire I heard in the first videos out of Las Vegas is something I wasn’t prepared for. It sounded like a mechanical rattlesnake, where every rattling bead was a deadly strike seeking out an innocent target. It was sickening. I thought of every music festival and large-scale event I’ve been a part of. I cursed whoever made it possible for the shooter to get their hands on such weapons of mass devastation. I swore at whoever was listening. I read a book to calm my nerves, set it down, and counted my breaths until an uneasy sleep retook me. Unlike many people, escaping into my work during the day wasn’t an option. Still, I think it’s easier for most to understand what it’s like inside a newsroom today than it may have been in the past. Everyone is sorting through misinformation and official information to try and determine what’s real. That’s especially true when a tragedy strikes in Las Vegas and you are based in Chicago — the information you receive is probably from statements streamed live, local affiliates, or carefully constructed press releases. And there’s almost a script to how things unfold in America when a mass shooting takes place. The initial chaos of the attack. An estimate of the number of dead and wounded that will be revised up throughout the day. Eyewitness accounts about how “chaotic” the shooting was, as if any response to such an event could be organized in any way. Heartbreak. Loved ones lost. Earnest but under-informed reporters asking eyewitnesses to describe “the scene,” officials to update “the number” of dead and wounded, and police to outline “the investigation” as they determine whether any threat remains. But even to people who deal with tragedy on a daily basis, this attack was something different. There are still more questions than answers. And it remains unclear whether the one thing many of us would most like to know is something we will likely never understand: why? Multimedia journalist, life enthusiast, and restless digital native. Covering politics, technology, society and their intersections.